It’s pumpkin pie season! Raise your hand if you’re ready for Thanksgiving. I know I am. One of our Thanksgiving table staples growing up was pumpkin pie. I’ve learned recently that many people don’t actually eat pumpkin pie on Thanksgiving. And of those who eat it, many seem to do so grudgingly. Pumpkin pie isn’t just a staple for me, I think it’s absolutely delicious! I look forward to it every year and think a Thanksgiving table without it isn’t complete. But that’s just me. 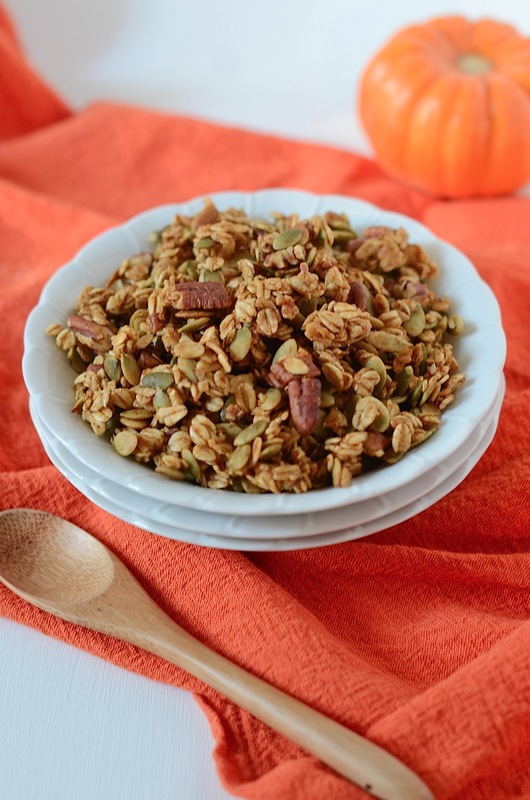 For my fellow pumpkin pie fans out there, here’s something to tide you over – a Healthy Pumpkin Pie Granola Recipe! As long time readers know, I love to make oil-free granola thanks to fruit based mixtures with applesauce or canned pumpkin. 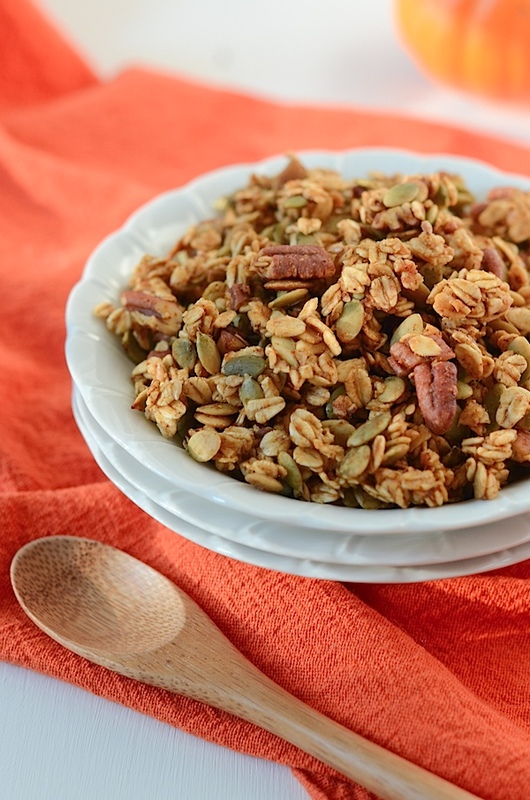 This Healthy Pumpkin Pie Granola Recipe is made with the latter. 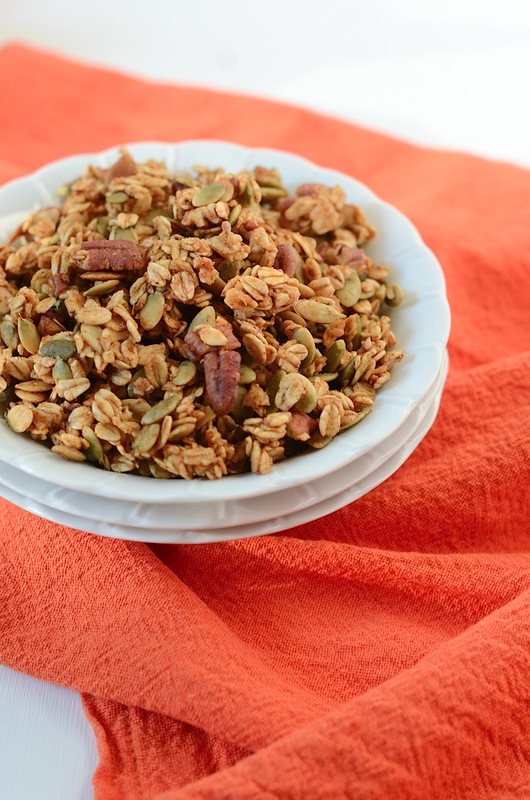 Toss in a little pumpkin pie spice, and you get a delicious breakfast granola. I thought about just adding pepitas (pumpkin seeds), which seemed like the obvious crunchy ingredient, but the pecans add a nice, buttery taste to the mix. I know pecans aren’t traditionally in pumpkin pie, but just go with it. It’s worth adding the pecans in for the texture and flavor. And about that texture, the optional brown rice syrup will help give this granola a stickiness and chewiness that I really enjoy. 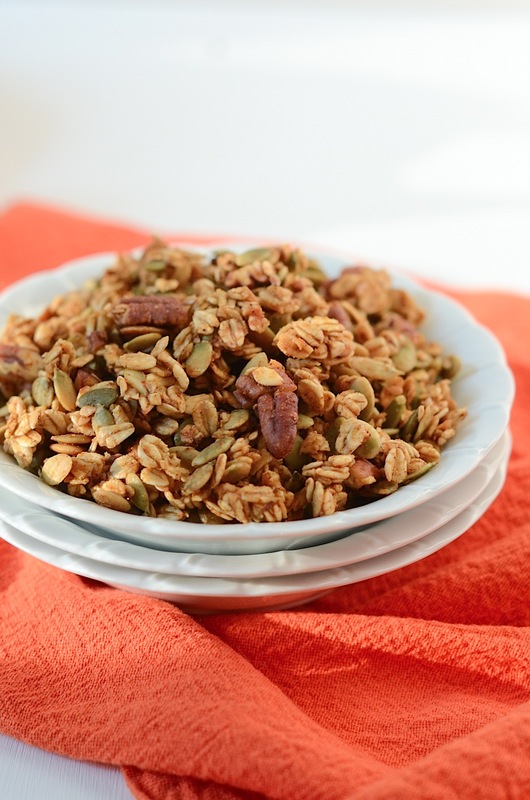 I love when the granola clusters up a bit, so I do recommend adding that extra ingredient to this Healthy Pumpkin Pie Granola Recipe. Brown rice syrup is great for many recipes (including this healthy coconut macaroon one). 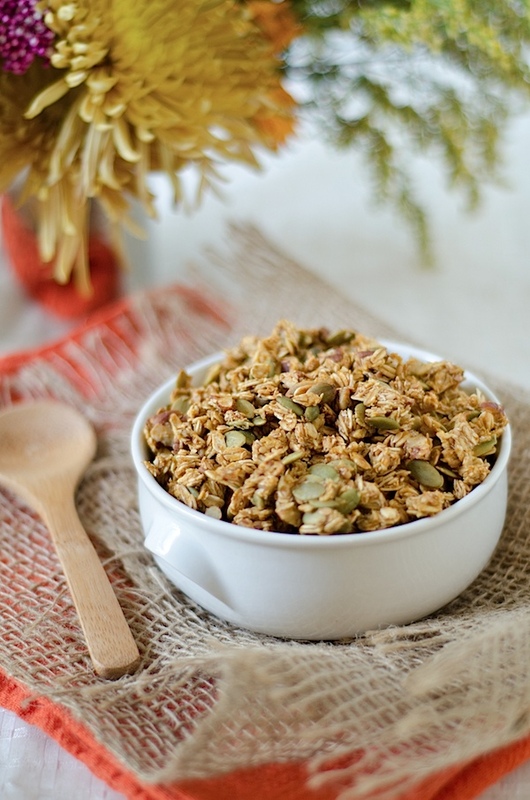 I love using canned pumpkin to make oil-free granola, so I decided to pull together some classic dessert flavors to make this Healthy Pumpkin Pie Granola Recipe. Whip up a batch for your family or to give out as gifts to friends, family, neighbors, and co-workers. Serve with milk or my favorite way – over yogurt. Pre-heat oven to 300 degrees F and line a large baking sheet with parchment paper. In a large bowl, combine dry ingredients oats, pepitas, flaxseed (if using), and pumpkin pie spice, and stir to mix well. In a medium bowl, combine wet ingredients canned pumpkin, brown rice syrup, maple syrup, additional sweetener (if using), vanilla, and salt and stir with a whisk to mix well. Add wet mixture to dry mixture and stir until wet mixture is evenly distributed. Pour granola mixture onto prepared baking sheet and spread to an even layer. 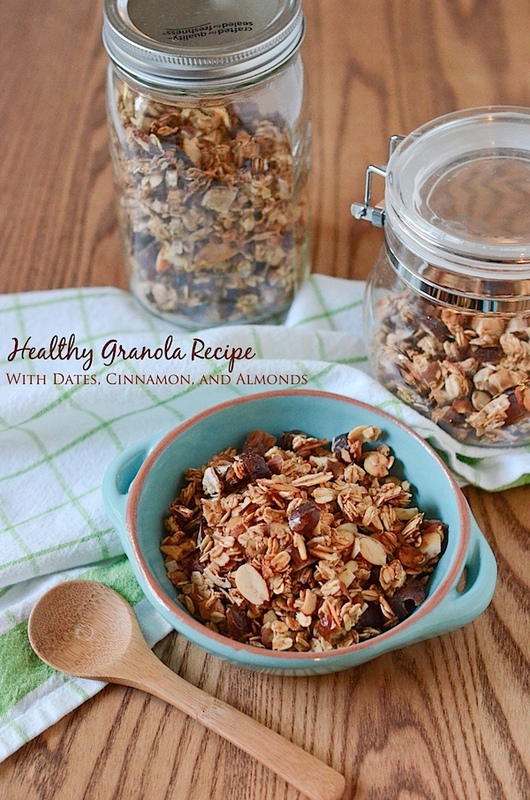 Bake, stirring every 15 minutes for 45-60 minutes, or until granola is browned to preference. Set aside to cool to room temperature. Serve with yogurt or milk. Note: If you really love pumpkin pie spice, you may want to add a little extra (maybe 1/2 teaspoon?). Mix up the ingredients, taste test, and add more till you’re happy with the flavor. 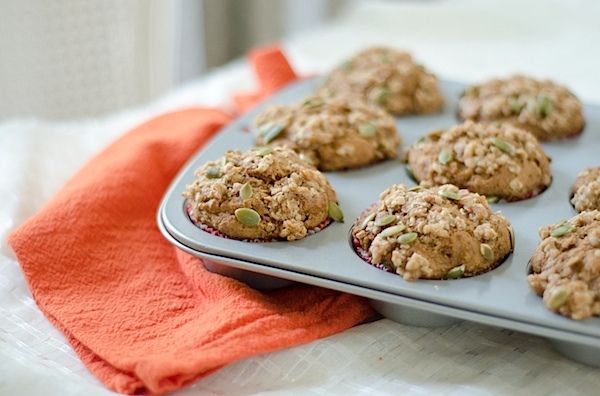 Check out these healthy pumpkin recipes featured over at Women’s Health Mag – one of them is from The Chic Life! Thanks for stopping by! Hope you enjoy the recipes!